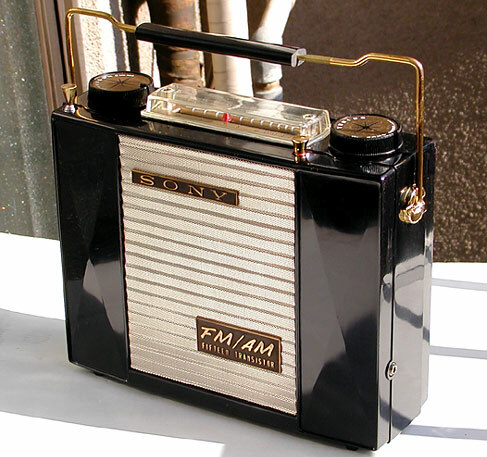 Meet Sony's first AM/FM transistor radio and, according to the company's own history, the first transistor radio in the world to include an FM band. Sony exhibited the TFM-151 at the 7th annual Audio Fair in Tokyo in October 1958 and then released it for sale as an export-only model the following month. I suspect it was sold only in a few select markets, including the US and Canada, (likely along with Australia and a few European countries). To date, all evidence suggests that Sony built only around a thousand units*, making this a radio that not only boasts great historical significance but also one that is extremely rare. Needless to say, these are highly valued today by the collectors who own them. The TFM-151 was without a doubt one of the few true luxury transistor radios of the fifties. And, while Sony did deliver a lot of radio for the buyer's $149.95, I'm convinced this model was released as much to stir conversation and gain mind share as for any other purpose. In addition to the FM band, surely it had to be the only radio in its day to employ 15 transistors, (8 of these in the FM circuitry), 4 diodes and a varistor. The stylish cabinet design that presents a "mirror image" whether viewed from the front or rear was inherited from its earlier AM/SW siblings. But this model displays an evolution to a more modern appearance that combines black with gold-plated trim in a classy manner worthy of its lofty position. It also includes the introduction of a metal speaker grille finished in champagne gold to replace the plastic latticework grille of the TR-74 and TR-741. Adding highlight to the new grille are the large metal badges. Note how the lower badge (and product label inside) emphasizes the new FM band by way of the "FM/AM" word order. * [07.04.15]: After adding several more samples to my database, I've now seen a range of serial numbers that suggests that maybe a little over a thousand units were built. Part of the fun is keeping my eyes open and learning as I proceed!